If you are reading this blog, then I am sure you are no stranger to the concept of social media. In the past 10 years, social media has evolved to a revolutionary tool that people use for various different reasons. One organization in particular, JAR of Hope, utilized social media to spread the word about their cause. JAR (representing the young boy James Raffone’s initials) of Hope, is a charity organization dedicated to funding research for a cure to the detrimental disease Duchenne’s Muscular Dystrophy. It is a disease that promotes muscular degeneration and weakens the body. It is one of the 9 types of muscular dystrophies that are known today. There are medications that can slow down the muscular degeneration, but for all 9 forms- there is no cure. Facebook has been the organization’s biggest platform to gain notoriety. JAR of Hope started in a man’s home, with the desire and will to do anything in his power to help his son live a longer life. A GoFundMe page, a site where people can donate money to a certain cause, was created and shared on Facebook. 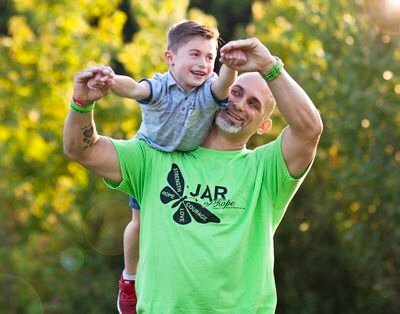 The touching story behind JAR of Hope about a man, his family, and his son, opened up the hearts and wallets of thousands of people. Had it not been for Facebook, JAR of Hope wouldn’t have been able to spread the word. Social media platforms have proven to be the biggest help in JAR of Hope’s journey. There is an extremely controversial drug that had been debated over for a very long time to try and treat Duchenne Muscular Dystrophy. For the families, this drug is a risk they are willing to take. JAR of Hope played a huge role in getting this drug recently approved in September of 2016. They utilized social media to spread the word, taking part in events and sharing it online. They attracted news companies, celebrities, families, strangers, and friends. Petitions were signed online for the support in passing the drug. JAR of Hope held activities that would engage the public and spread awareness. In the hometown where the organization started, Manalapan, NJ- JAR of Hope held a push up challenge at the recreation center that would attempt to break the world record, and then proceeded again in Coney Island Brooklyn, NY. Through Twitter, Facebook, and the newfound fame they had achieved, they were able to get so many participants and news coverage. A few of years ago when JAR of Hope was first created, being a big foundation was just a big dream for a father and his son. Now, they have reached high enough success to have news publicity and famous people supporting their cause. One of the most recent celebrity to support JAR of Hope is the SETS group, including famous UFC Champion Frankie Edgar. The group took on the world’s toughest mudder challenge representing JAR of Hope- Team Jamesy. JAR of Hope has also utilized social media, most often Facebook, to become a voice for the people and families suffering from this disease. Muscular Dystrophy is a defeating disease, and in the past has not been given much attention. Victims like Ricky Tsang, are finding their voices, and JAR of Hope is helping them spread the word. They are using these platforms of hope to spread awareness, give people an understanding of what this disease is, and they are raising money for research so that maybe one day there will be a cure. But almost none of this would have happened without the use of different social media platforms. Social media has only increased the mass amounts of feeling they had inside them, hope.